Local police have released a video which shows that the woman was hit by an Uber self-driving SUV after walking out from a darkened area. In the video, the vehicle’s backup driver appears to be looking down away from the road before the crash, and seems startled at the moment of the impact. Experts who viewed the video footage told The Guardian that the vehicle’s sensors should have seen the woman walking onto the road and that the car should have braked automatically. 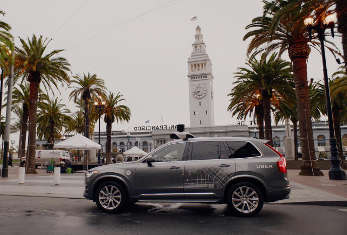 Arizona governor Doug Ducey told Uber’s chief executive Dara Khosrowshahi that the footage raised concerns about the company’s ability to safely test its autonomous cars. The governor’s decision is a step back from his previous stance on self-driving vehicles. In February last year, he welcomed Uber to test their vehicles in Arizona under few regulations after they were banned from California over safety concerns. In early March, he also authorised tests to run without anyone in the car to act as a safety operator. The crash was the first fatality involving an autonomous vehicle in the US. Uber immediately suspended its testing in Arizona and other US states. Last week, The New York Times reported that Uber’s own documents showed its testing program had a number of problems, including difficulty driving through construction zones. Tests have also reportedly shown that its vehicles require much more human intervention than those run by similar companies. It is not clear when Uber will re-introduce testing.